3 Top Rated Kneeling Chairs For Home or Office Fitbit Flex vs Charge Activity Wristbands: What Is the Difference Between Them and Which Is Best? Best Body Composition Monitors: Omron HBF-514C vs. Tanita BC-548 Ironman, Which To Buy? What Is a Body Composition Monitor? a body composition monitor is like a body scale but gives you more detailed information about your weight so you can accurately measure the progress of your weight loss. It works just like a body scale, you stand on it and it starts to analyze your weight in details: body fat measurement, water weight, muscle mass and BMR (Basal Metabolic Rate). Keeping an eye on these measurements gives you a true insight on your weight and what you should do next in your body loss or fitness journey. How Does a Body Composition Monitor Work? a body composition monitor has different sensors than a normal body scale. It uses Bioelectrical Impedance Analysis, a safe electric signal that is passed through your footpads that can analyze the details of your weight like body mass vs water weight and fat. The reading is then reflected on your body composition monitor. Which Are The Best Composition Body Monitors To Buy? Uses 6 advance monitors to analyze your body weight and composition. 90 days memory function stores all your fitness readings. Measures 7 fitness indicators: Body weight, BMI, Body fat percentage, Muscle, Metabolism, Body age and Visceral fat level (far around internal organs). Up to 4 person profiles. 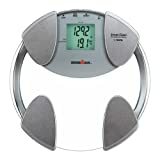 Click here to learn more about this body composition monitor, read the customer reviews and buy it. 2 modes: standard and athlete. Click here to learn more about this Tanita body composition monitor, read the customer reviews and buy it. What Is The Difference Between Omron HBF-514C and Tanita BC-548 Ironman Body Composition Monitors? The Omron HBF-514C has one extra reading, which is the Visceral fat level. The way these body composition monitors operate are different. With the Tanita, you simply stand on it and it does the rest. As for the Omron, it uses hands sensors as well as foot sensors to get accurate reading. The Omron is suited for most people, but not for athletes or bodybuilders. The Tanita on the other hand has two modes, standard and athlete. The Omron HBF-514C seems to be a more popular choice for its advanced monitoring capability and extra fitness reading. So we’d highly recommend it for those reasons.